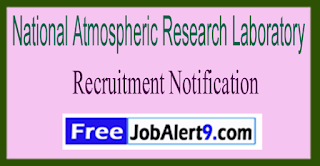 NARL (National Atmospheric Research Laboratory) Has Released Recruitment Notification For 12 Junior Research Fellow, Research Associate Posts. All Eligible & Interested Candidates Can Apply Online.Further Detailed Information Regarding Educational Qualifications, Age Limit, Selection Procedure, Exam Pattern, Syllabus for NARL (National Atmospheric Research Laboratory) Recruitment 2017 - 12 Junior Research Fellow, Research Associate Post is mentioned below. Age Limit - Candidates upper age limit should not Exceed 30 -Years (JRF/PJRF), 35 -Years (RA/PDF). Selection Process - All Eligible Candidates will Be Selected Based on Their Performance In Test / Interview . Pay Scale - Rs. 36,000/- (Research Associate), Rs. 25,000/- 1st Year (JRF/PJRF), Rs. 28,000/- 2nd Year (JRF/PJRF) . How To Apply - All Eligible & Interested candidate fill the online application through official web-site (http://www.narl.gov.in). After successfully submitting the application, candidate must send by hard copies of application a long with relevant testimonials to the following Address before / (5th June 2017). Address -THE ADMINISTRATIVE OFFICER (R&R), NATIONAL ATMOSPHERIC RESEARCH LABORATORY, P.B.NO.123, S.V. UNIVERSITY CAMPUS, TIRUPATI – 517502, A.P . Starting Date of Online Registration of Application Form Is - 08-05-2017. Last Date To Submit Online Application - 05-06-2017. Click Here For NARL Recruitment 2017 Detailed Advertisement.